JOURNEY INTO MYSTERY #103 (1964) CGC 8.5 1ST APP OF ENCHANTRESS & EXECUTIONER. Art Books & Art Prints. Journey Into Mystery #103 (1964). 1st Appearance of the Enchantress and the Executioner. Stories by Stan Lee and Larry Lieber. Art - Jack Kirby, Chic Stone & Larry Lieber. Cover - Jack Kirby & George Roussos. If you have any more questions about the condition of the book(s), please send us a message. To see all our auctions. Collector's Paradise is a small chain of 2 Comic Book / Collectibles stores, located in Greater Los Angeles area. First opened in 1994, we have grown and changed over the years to become a leader in the Los Angeles area comic book community. We are known for our amazing customer service, innovation in how we approach our business, and our amazing events with Creators of all types of collectibles. We now operate two stores, one in San Fernando Valley (Winnetka) and a 2nd one in Pasadena. Our feedback speaks volumes, but we are always eager to prove to a customer that we truly care about delivering the products and customer service we are known for. We package all items in a clean, dedicated packing area, with professional packaging, to highest specifications. Our fantastic feedback speaks for itself. We have gotten thousands of compliments, specifically for our quality of packaging. That does not mean that an error can not happen. If/when it does, we pride ourselves on our ability to fix the situation. It is our highest goal and best intention to provide exemplary customer service. Open and honest two-way communication is the key. Listing and template services provided by inkFrog. 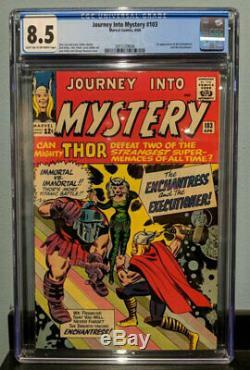 The item "JOURNEY INTO MYSTERY #103 (1964) CGC 8.5 1ST APP OF ENCHANTRESS & EXECUTIONER" is in sale since Friday, March 15, 2019. This item is in the category "Collectibles\Comics\Silver Age (1956-69)\Superhero\Thor". 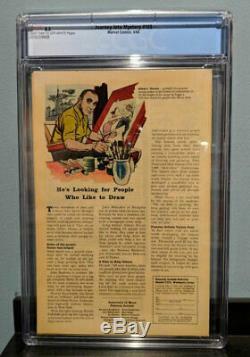 The seller is "comicsandcardsdotnet" and is located in Winnetka, California. This item can be shipped worldwide.